It's always amazing how a really good plan can get messed up so quickly. Unfortunately, there isn't an exception to this when it comes to blogging and making web videos. A couple of weeks ago, the streets of Warrendale were flooded with rain water that wasn't able to flow down the storm drains. Those aforementioned drains were clogged with assorted debris that no one ever bothered to clear away. I had the novel idea of making a short video that I would stick on YouTube. 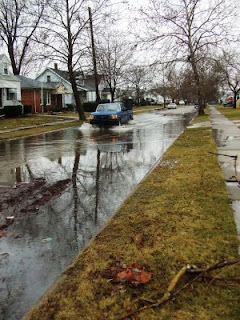 I start by showing the flooded street then I would show how easy it was to solve the problem by clearing away the debris that was clogging these storm drains with a shovel. Well, that idea got broadsided by Murphy's Law. I spent almost an hour in the rain trying to find the [explitive deleted] storm drain that was hiding under all that water. I eventually gave up and stormed away, convinced I could hear that Murphy guy laughing at me somewhere. Anyway, I did record a few seconds of video. It's the before shot that never got it's after version. I wasn't sure what I should do with it. I finally decided to admit my defeat publicly by posting it here. Cool, huh? You can clearly tell that I make videos like this for a living. Anyway, just imagine how cool my short video would have been if you actually got to see a shovelful of muck being hauled up to the surface; followed immediately thereafter by the gushing water as it flowed down the newly freed storm drain. The end credits then would have rolled as we saw normal, healthy streetlife return to Warrendale. I swear, I could have won a Webby if my plan had worked.